This is the final part in a weekly series focusing on Connecticut’s five gubernatorial candidates and their respective plans for reinvigorating the state’s economy and closing a $1.4 billion budget deficit projected for after the election. Gov. Dannel P. Malloy doesn’t dispute there’s a sizeable hole in the next state budget – as nonpartisan analysts see things. He just thinks their perspective doesn’t reflect political reality. According to the Stamford Democrat who is seeking a second term, the situation is much rosier than the numbers show. And while there is more to do, his administration has positioned Connecticut’s finances and its economy for a prosperous future. “I think there are some real aspects to [the deficit,] and then I think there are all kinds of muddied aspects to it,” Malloy told The Mirror during an interview last week. When the legislature’s nonpartisan Office of Fiscal Analysis projects a $1.37 billion hole in 2015-16 finances, more than $300 million of that is an inflationary adjustment. 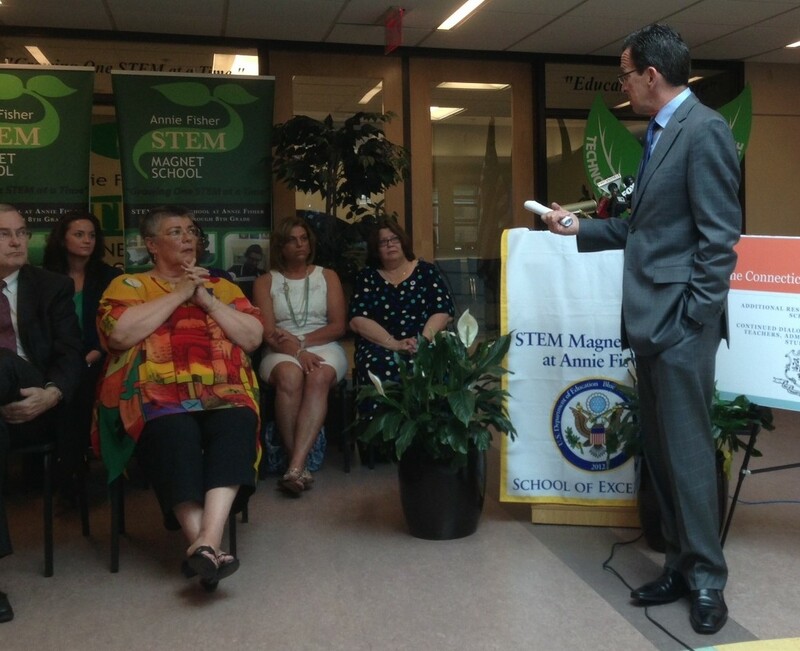 But Malloy said state agencies routinely are asked to make do without any inflationary funding bump. Similarly, analysts count some mandated increases in town aid that legislatures and governors routinely waive year-after-year. OFA counts contractually obligated pay raises for workers, but doesn’t consider that the governor might freeze vacant posts to offset those costs. The governor insists these and other efficiencies can whittle away three-quarters of the projected shortfall. As far as the remainder, less than $400 million in red ink, “I have dealt with that size problem throughout my political career,” said Malloy, who served 14 years as Stamford’s mayor. through 2009. He’s right. The governor’s critics, both on the left and the right, don’t believe it. “Governor Malloy is not being honest if he’s saying we can simply grow our way out of these problems,” said Republican gubernatorial contender John P. McKinney of Fairfield, the state Senate’s minority leader. The governor frequently notes that the nonpartisan deficit forecast is built on an assumption that spending must grow 7.5 percent next year. Why would they do that? he asks, noting that his administration has kept budget growth under 3 percent per year. The state workforce alone is down almost 5,000 positions since the governor took office. — Almost $200 million in annual debt payments were refinanced, effectively removing them from last year’s budget and from the current one – and returning them after the election with higher interest costs. — About $220 million in approved tax relief for retired teachers, consumers and businesses was delayed and comes due next year. — While borrowing funds last winter to bolster its checkbook, the state actually borrowed an extra $39 million to cover its pre-election debt payments on the original loan. And despite decrying borrowing for operating costs, Malloy artificially reduced official budget spending by shifting some expenses onto the state’s credit card. — Canceling an early $222 million debt payment in June 2012. Instead they used $138 million to close a year-end operating deficit and put $94 million into the Rainy Day Fund. — Bonding $173 million in new municipal aid over this fiscal year and the last one. — Bonding $57 million for pollution abatement and stem cell research grants that previously were paid out of the operating budget. And in 2012 and 2013, the state used $118 million in proceeds from bond premiums –bonds sold for an extra sum above their base value, typically in exchange for the state’s paying a higher interest rate. Those proceeds effectively were used to support the operating budget and not to pay down some other high-interest debt. Gov. Dannel P. Malloy and other governors meeting at the White House. But what the news media and his critics are missing, the governor continued, is perspective. Malloy, who inherited an unprecedented 18 percent budget deficit — close to $3.7 billion — when he took office four years ago, also was saddled with the slowest national recovery since the Great Depression, cash-starved pension funds and a retiree health care program with almost nothing saved to cover $20 billion in long-term obligations. Further complicating matters, Malloy had narrowly defeated Greenwich businessman Tom Foley in a 2010 campaign in which Foley offered the highly controversial claim he could close a historic deficit without tax hikes, without borrowing – or even touching the local education grants that comprise a ninth of the entire budget. The governor’s solution, which he labeled “Shared Sacrifice,” included about $1.8 billion in tax hikes, a major workers’ concessions package, and spending well below the level needed to maintain current services. He also locked Connecticut into an ambitious, long-term plan to catch up on its state pension payments and to begin saving for its retirement health care obligations. And while Malloy continues to take heat for the tax hikes, he kept his own campaign pledge to spare municipal aid from the state budget axe. “Almost no – perhaps no – police officers, firemen or teachers employed by the municipalities have lost their jobs because of something I have done, and I feel pretty good about that,” he said. 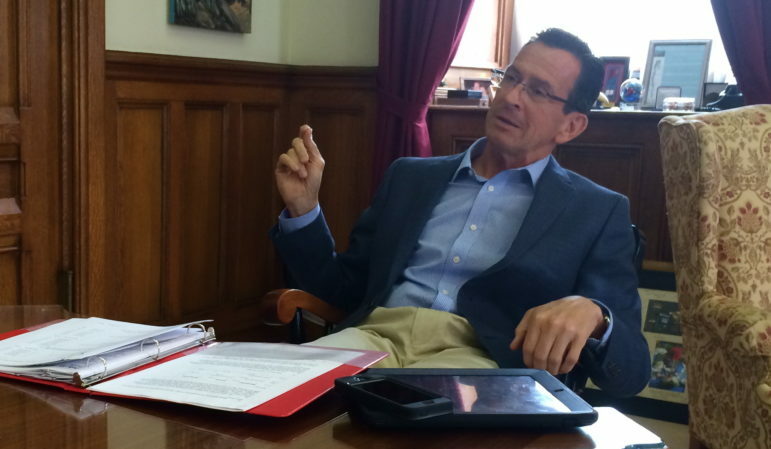 Rather than note that post-election deficit is only about 40 percent the size of the gap he inherited, Malloy tries to point to the $392 million he has set aside in the budget reserve. During the 2010 campaign, many people referenced Lowell P. Weicker Jr., the governor who led Connecticut through the 1991 budget crisis and insisted upon adoption of a state income tax to provide fiscal stability. On the cusp of an economic surge? Gov. 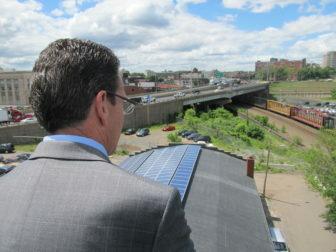 Dannel P. Malloy inspecting rooftop solar panels. So what then remains to be done? The governor said he’s confident that both the nation’s and Connecticut’s economy are on the cusp of a major surge. Swelling tax receipts not only will close whatever part of the deficit he can’t close with efficiencies, he says, but will also provide opportunities for future tax cuts. The governor said the latest deficit forecast is built on revenue projections that are “extremely conservative.” But that forecast is developed jointly by his budget staff and by nonpartisan legislative analysts. “We are making real progress,” the governor said, adding that the state has recovered more than 50,000 private-sector jobs since the last recession ended. And though his rivals have criticized some of the corporate aid his administration and the legislature have approved, the governor said it ranks among his proudest accomplishments. “You can go to bed at night not thinking that United Technologies is going to move out tomorrow,” he said, referencing a deal this spring to provide up to $400 million in tax breaks to the state’s largest employer to trigger a major facilities expansion and to preserve Connecticut’s aerospace and engineering base. Foley, who is running again for governor this year, charged Malloy has had to “bribe” companies to stay here because of the large tax hike adopted in 2011. “That’s like stepping on the accelerator and the brake at the same time,” Foley said. Connecticut has recovered just over 60 percent of the 121,000 jobs it lost in the last recession. And while a new forecast from the University of Connecticut in July said the rate of job gains should improve over the next 12 months, it still estimated modest growth — about 5,000 to 8,000 new positions during that period. If that’s correct, Malloy’s hopes for a major economic rebound would rest with Wall Street and the state’s financial services sector. And while the stock markets have rebounded, that hasn’t translated yet into big increases in tax receipts for the state. Are tax cuts really coming? Gov. Dannel P. Malloy. At left are Mark Waxenberg and Melodie Peters, leaders of teachers’ unions. One place where Malloy does agree with most of his opponents – at least in part – is that state government will be positioned to start cutting taxes after the election. A new income tax exemption for retired teachers, sales tax breaks on clothing and non-prescription medication, and the end of the corporation tax surcharge already are on the books. McKinney and Foley have unveiled specific proposals. The former would end income taxes on households earning less than $75,000 while Foley would remove one-half of 1 percentage point from the sales tax and scrap a $250 biennial levy on small businesses. Pelto is at the other end of the spectrum, insisting that a major tax hike on the wealthy is needed to safeguard public services, public employees’ pensions, and municipal aid. While Malloy repeatedly touts that the state workforce is much smaller now than it was under his Republican predecessors, the state employee unions that strongly backed him in 2011 still insist that many agencies are badly understaffed. “It’s important for the governor and the legislature to maintain and ultimately strengthen the commitment to delivering the topnotch quality services people need, particularly in these tough economic times,” Larry Dorman, spokesman for Council 4 of the American Federation of State, County and Municipal Employees, told The Mirror last winter. Still, Malloy has been very clear since May – when a declining revenue forecast forced him to scrap plans for a $55-per-person tax rebate this fall – that tax increases were off the table. “I gave at the office,” he quipped at the time. The governor retained that proviso last week, but also told The Mirror he’s confident the growing economy will mean several more steps can be taken to bolster Connecticut’s business climate. That means not only greater investments in transportation infrastructure, but also more tax cuts. And though he didn’t propose any specifics, Malloy said he’s counting on a new tax study he and the legislature launched this summer to show which cuts can make Connecticut more competitive with neighboring states.